The best way to get good apples is to grow them yourself. We're getting there, but it takes time. The second best way would be to team up with a farmer whose tastes and growing philosophy mesh with your own and pick your apples from his orchard. Or buy his apples at a farmer's market. I wish I'd gotten more than half a bushel of those delectable Winesaps, but I'm afraid they're all gone now. We couldn't eat a bushel of apples before they go soft if we kept them in the house, but the fridge root cellar has room between baskets of carrots to keep apples crisp. 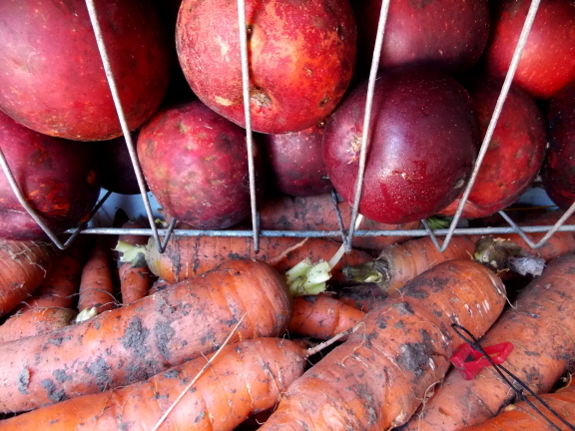 They say not to store apples with potatoes, but my carrots don't seem to mind the ethylene-producing neighbors. What do you stock up on from the fruit stand to keep your winter meals cheap and tasty?